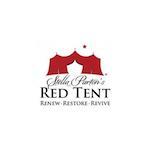 I’m thrilled to have been asked to be a part of the first annual Red Tent Women’s Conference April 18-20th here in Nashville. Combining music, stories, and plenty of laughter, Stella Parton’s Red Tent Women’s Conference is an exclusive weekend of inspirational stories by women who are reclaiming their voice as world changers. Magic happens when women share their stories. The event exists to support and inspire women to live authentic lives through the work they do. For more information on speakers, tickets and the Friday night concert with Dolly Parton, visit the Red Tent Women’s Conference website.